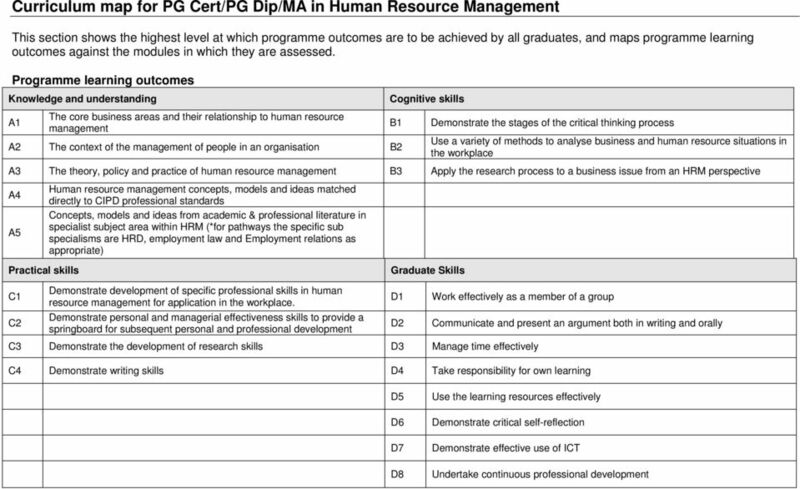 Download "Programme Specification and Curriculum Map for PG Cert/PG Dip/MA in Human Resource Management"
1 Programme Specification and Curriculum Map for PG Cert/PG Dip/MA in Human Resource Management 1. 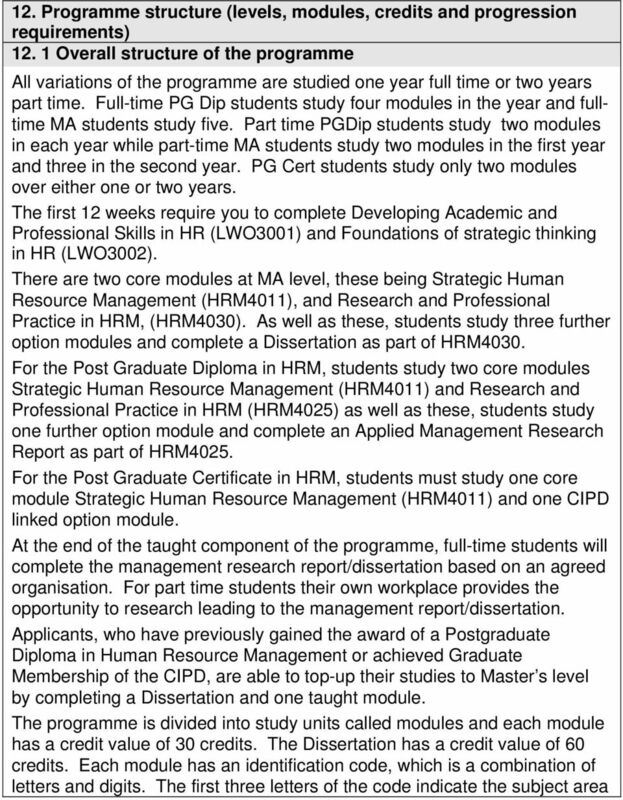 Programme title MA Human Resource Management 2. Awarding institution Middlesex University 3. Teaching institution Middlesex University 4. 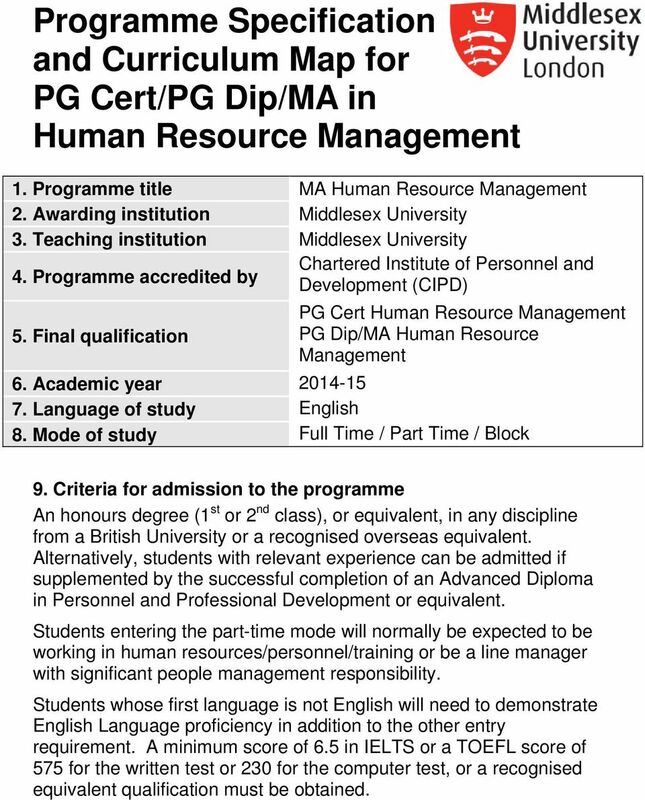 Programme accredited by Chartered Institute of Personnel and Development (CIPD) PG Cert Human Resource Management 5. 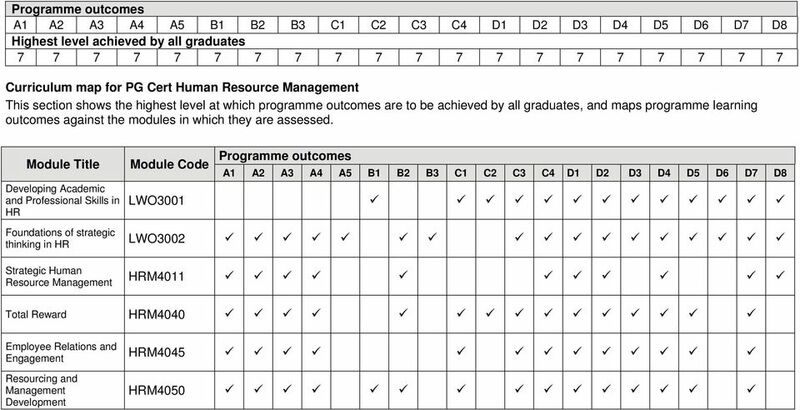 Final qualification PG Dip/MA Human Resource Management 6. Academic year Language of study English 8. Mode of study Full Time / Part Time / Block 9. Criteria for admission to the programme An honours degree (1 st or 2 nd class), or equivalent, in any discipline from a British University or a recognised overseas equivalent. Alternatively, students with relevant experience can be admitted if supplemented by the successful completion of an Advanced Diploma in Personnel and Professional Development or equivalent. Students entering the part-time mode will normally be expected to be working in human resources/personnel/training or be a line manager with significant people management responsibility. Students whose first language is not English will need to demonstrate English Language proficiency in addition to the other entry requirement. A minimum score of 6.5 in IELTS or a TOEFL score of 575 for the written test or 230 for the computer test, or a recognised equivalent qualification must be obtained. 2 10. 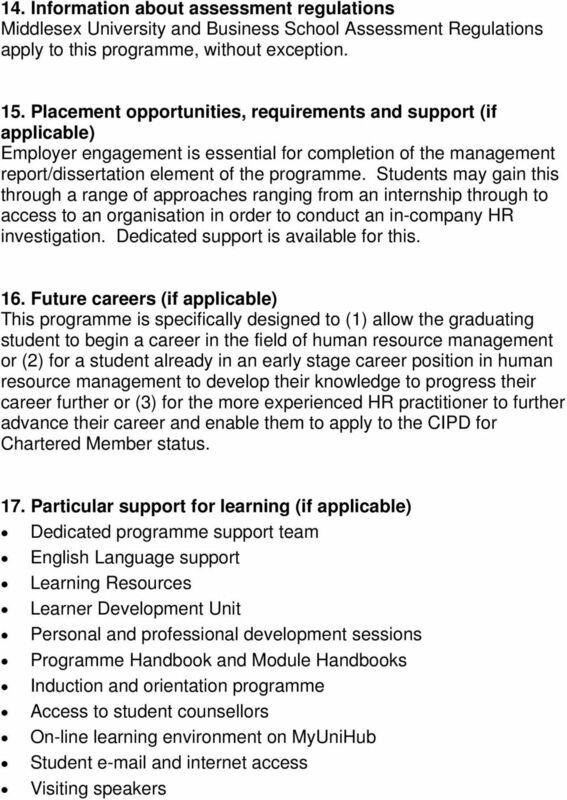 Aims of the programme The programme aims to: Equip its graduates with the knowledge, skills and competence to a level where they can make a professional and strategic contribution to an organisation s management of its human resources. Provide core business subjects relevant to human resource management Develop a practical understanding of, and relevant skills in, functional human resource management areas. Explore key strategic human resource issues facing contemporary organisations. 11. Programme outcomes A. Knowledge and understanding On completion of this programme the successful student will have knowledge and understanding of: 1. The core business areas and their relationship to human resource management; 2. The context of the management of people in an organisation; 3. 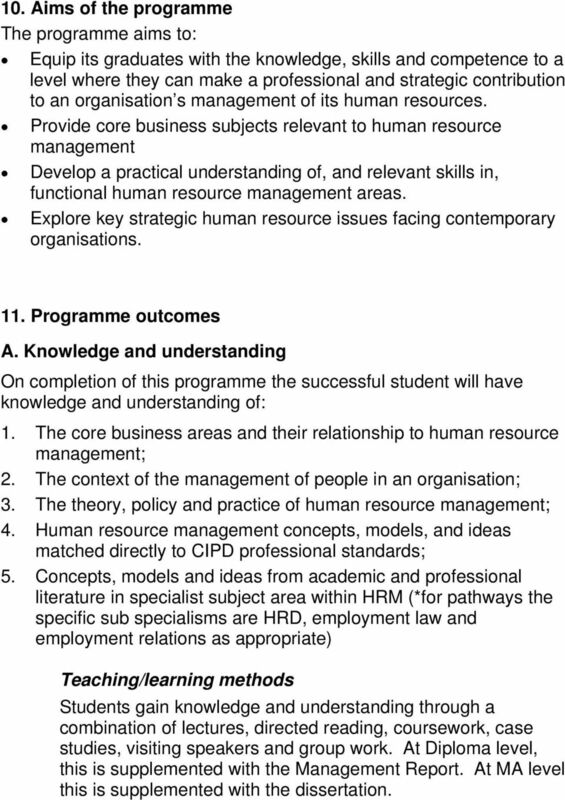 The theory, policy and practice of human resource management; 4. Human resource management concepts, models, and ideas matched directly to CIPD professional standards; 5. Concepts, models and ideas from academic and professional literature in specialist subject area within HRM (*for pathways the specific sub specialisms are HRD, employment law and employment relations as appropriate) Teaching/learning methods Students gain knowledge and understanding through a combination of lectures, directed reading, coursework, case studies, visiting speakers and group work. At Diploma level, this is supplemented with the Management Report. At MA level this is supplemented with the dissertation. 3 Assessment Methods Students knowledge and understanding is assessed by group and individual coursework and unseen examination. At Diploma level, this is supplemented with the Management Report. 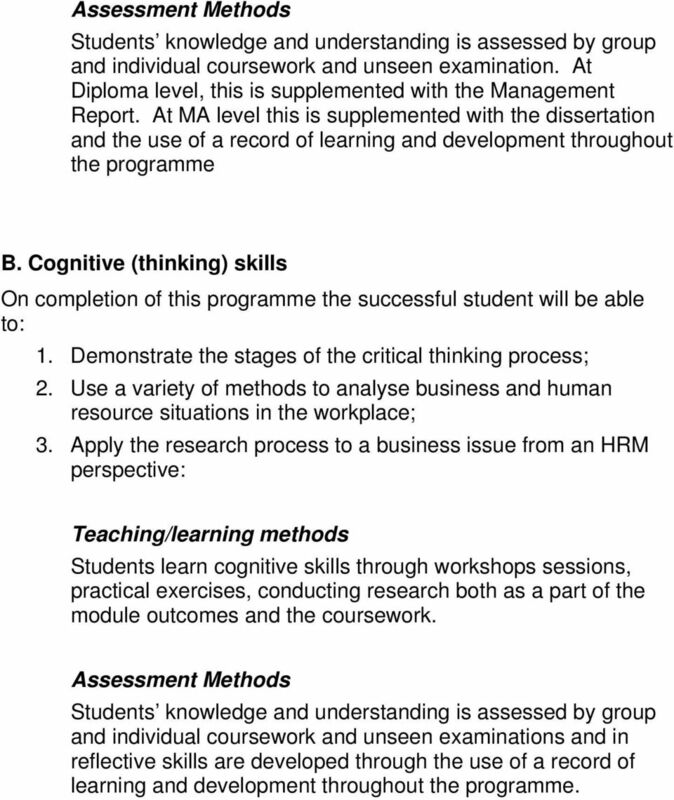 At MA level this is supplemented with the dissertation and the use of a record of learning and development throughout the programme B. Cognitive (thinking) skills On completion of this programme the successful student will be able to: 1. Demonstrate the stages of the critical thinking process; 2. Use a variety of methods to analyse business and human resource situations in the workplace; 3. Apply the research process to a business issue from an HRM perspective: Teaching/learning methods Students learn cognitive skills through workshops sessions, practical exercises, conducting research both as a part of the module outcomes and the coursework. Assessment Methods Students knowledge and understanding is assessed by group and individual coursework and unseen examinations and in reflective skills are developed through the use of a record of learning and development throughout the programme. 4 C. Practical skills On completion of this programme the successful student will be able to: 1. Demonstrate development of specific professional skills in human resource management for application in the workplace; 2. Demonstrate personal and managerial effectiveness skills to provide a springboard for subsequent personal and professional development; 3. Demonstrate the development of research skills; 4. Demonstrate writing skills. Teaching/learning methods Students learn professional, personal and practical skills through a series of developmental workshops which form part of the core modules. For full-time students, exposure to real organisations will be provided with opportunities for reflection while part-time students will reflect on their learning in their workplace experience. Methods will include visits, consultancy assignments, role-play, syndicate exercises, live interviewing practice, and research methods sessions and the use of a record of learning and development throughout the programme. Assessment Methods Students professional practical and personal skills are assessed by group and individual coursework and reports, the preparation of a record of learning and development, and a dissertation. 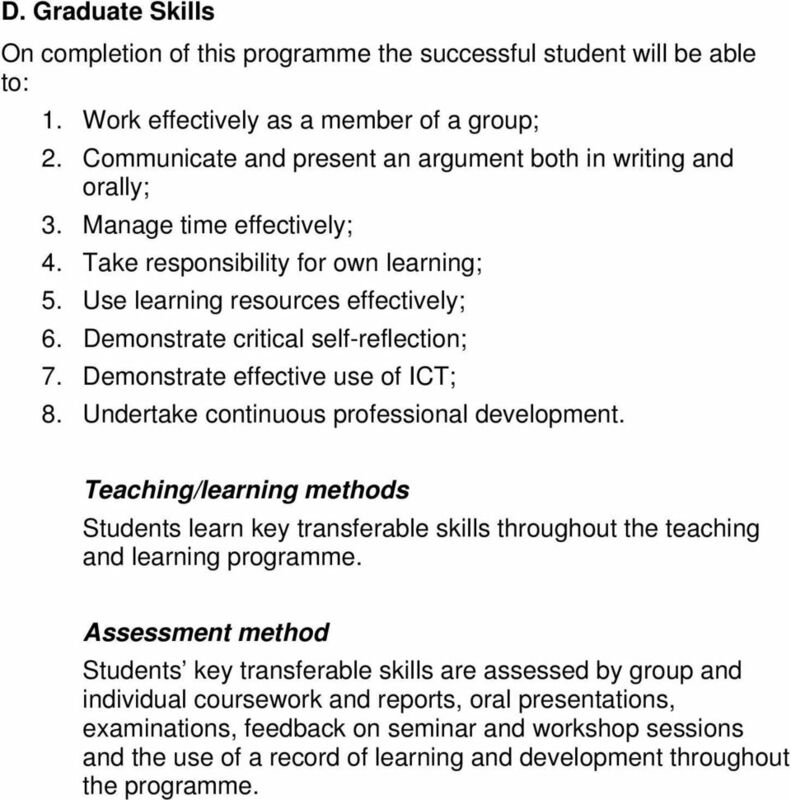 5 D. Graduate Skills On completion of this programme the successful student will be able to: 1. Work effectively as a member of a group; 2. Communicate and present an argument both in writing and orally; 3. Manage time effectively; 4. Take responsibility for own learning; 5. Use learning resources effectively; 6. Demonstrate critical self-reflection; 7. Demonstrate effective use of ICT; 8. Undertake continuous professional development. Teaching/learning methods Students learn key transferable skills throughout the teaching and learning programme. Assessment method Students key transferable skills are assessed by group and individual coursework and reports, oral presentations, examinations, feedback on seminar and workshop sessions and the use of a record of learning and development throughout the programme. 7 and the first digit of the module number indicates the level of the module e.g. HRM4011 indicates Human Resource Management at level 4 (level 7 on the Qualification Framework). 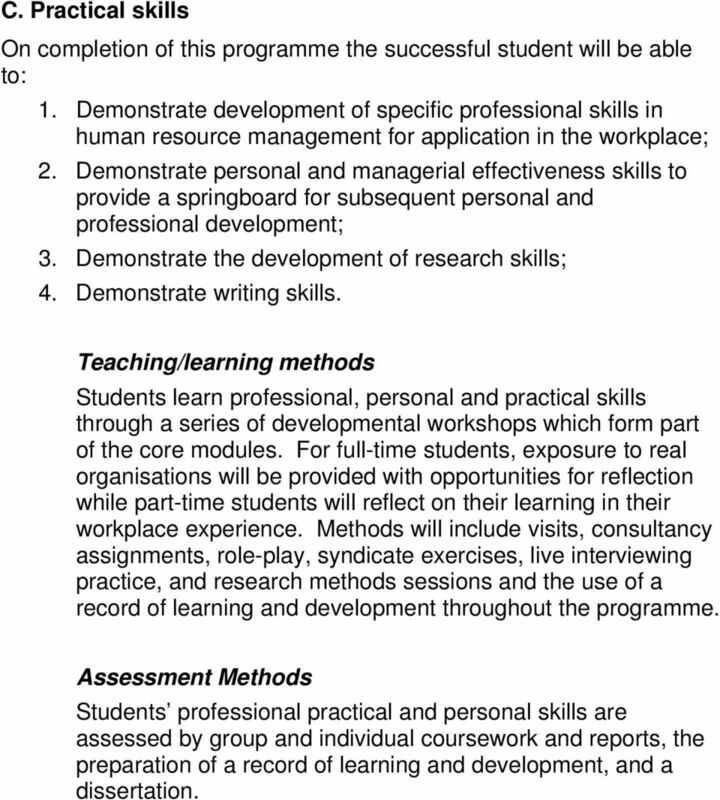 A summary outline for each module, known as a Module Narrative is provided at the end of the Programme Handbook. The academic provision of the University is based on credit accumulation. Students accumulate credit points by passing modules in order to gain the awards of the University. To gain a Postgraduate Certificate a student must gain 60 credits at level 4, for a CIPD accredited Postgraduate Diploma 120 credits and for a CIPD accredited MA degree a student must gain 180 credit points at level Levels and modules. 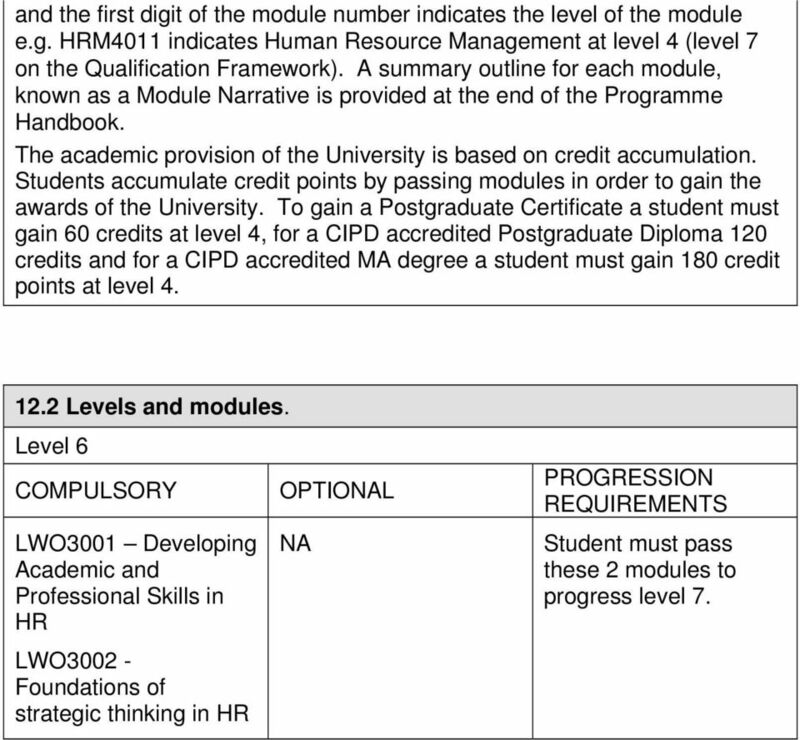 Level 6 COMPULSORY LWO3001 Developing Academic and Professional Skills in HR LWO Foundations of strategic thinking in HR OPTIONAL NA PROGRESSION REQUIREMENTS Student must pass these 2 modules to progress level 7. 10 18. 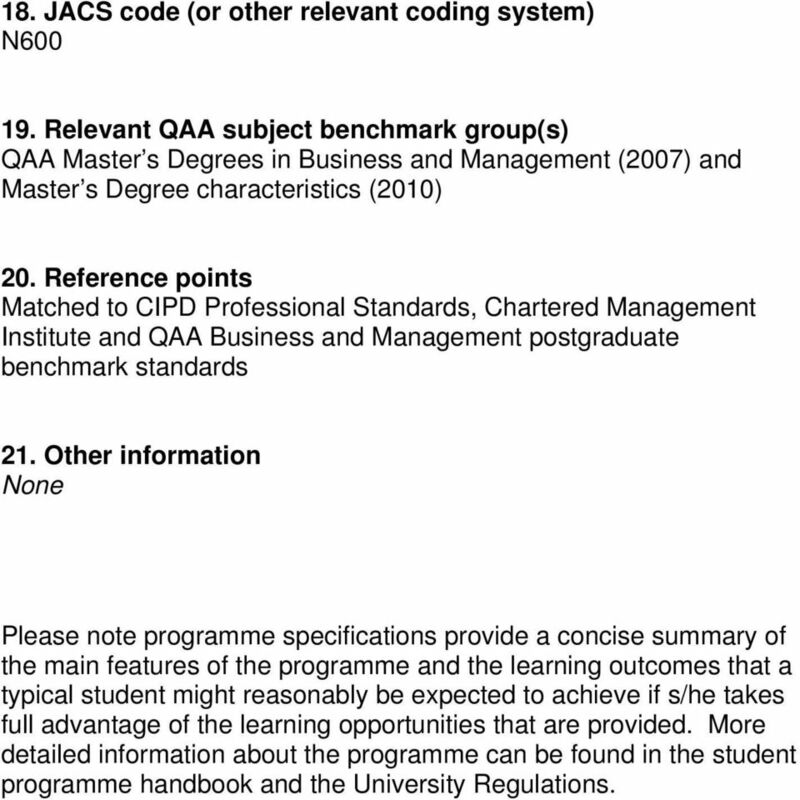 JACS code (or other relevant coding system) N Relevant QAA subject benchmark group(s) QAA Master s Degrees in Business and Management (2007) and Master s Degree characteristics (2010) 20. Reference points Matched to CIPD Professional Standards, Chartered Management Institute and QAA Business and Management postgraduate benchmark standards 21. Other information None Please note programme specifications provide a concise summary of the main features of the programme and the learning outcomes that a typical student might reasonably be expected to achieve if s/he takes full advantage of the learning opportunities that are provided. More detailed information about the programme can be found in the student programme handbook and the University Regulations. 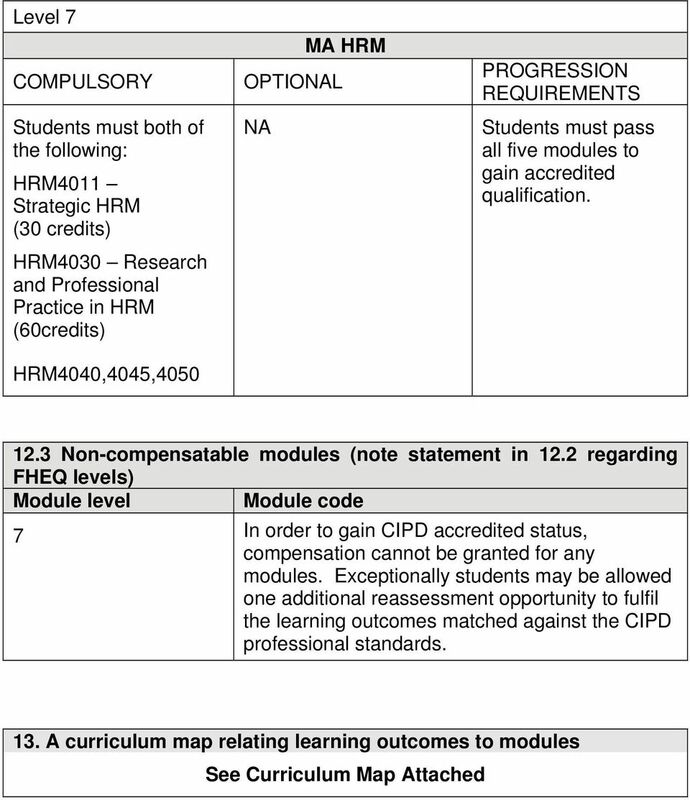 Programme Specification and Curriculum Map for Biomedical Science (Clinical Biochemistry) 1. Programme title MSc Biomedical Science (Clinical Biochemistry 2. Awarding institution Middlesex University 3.